For a long time now, Fender’s Stratocaster has been the unspoken unit of measurement in the industry. Every single guitar out there is compared to this legend at one point or another. What we have here is an American made Strat, which is basically as good as it gets in terms of vanilla Strats. It goes without saying it’s among the best electric guitars under a grand , and today we are going to talk about reasons why every single guitar player out there should have one of these. If there’s one body shape that everyone in the community knows, it’s that of a Stratocaster. After all, almost every guitar on the market today features a shape that was derived from this one. 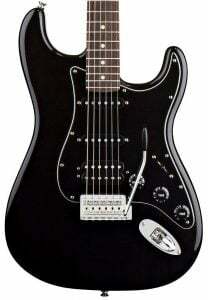 Fender American Special Stratocaster features an alder body, which has almost become its trademark. The neck is the usual design, with a 9.5 Inch radius and a sweet satin finish. Strats come with either a rosewood or a lacquered maple fretboard, and this one features the latter. Tremolo bridges are often times the weakest point of a guitar. We say often because there are designs out there such as Fender’s synchronized tremolo bridge, which don’t have those issues. This bridge features six fully adjustable saddles, and has a pretty awesome range. 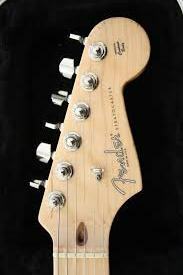 At the headstock, you will see a set of Fender’s F tuners, which excel when it comes to intonation and tuning retention. The hardware works flawlessly, as usual. You can bend the strings as aggressively as you need, and the whole thing will stay in tune. Pretty amazing, even though it’s expected by now. One of the trademark features of a Stratocaster are its three single-coil pickups. They are the key to that famous Strat tone, which many famous guitar players used as a foundation of their music. Fender American Special Stratocaster closely follows this tradition. The pups feature a greatly reduced single-coil buzz, and circuitry which is designed to keep up with your subtle playing techniques. Pots are made specifically to keep the bass as low as possible when you roll off the volume, which is pretty useful in a number of situations. In short, the electronics are bulletproof. The sound of a true American made Stratocaster needs no special introduction. Just put on any Eric Clapton track and you will find out. This guitar offers one of the best tone definitions out there, full of subtle details, impressive range and warmth rarely found elsewhere. Sure, it’s not a metal ax, even though some have used for that application, but it’s the quintessential rock guitar if there ever was one. They say that every guitar player needs to own or at least try out a genuine Fender Stratocaster once in their lives, and that is an advice we can get behind. This guitar made such an impact on modern music that it deserves all the praise it gets. If you are on a fence about taking the plunge and getting one of these pups, don’t be. Buying a Fender Stratocaster is always a good decision, simple as that. 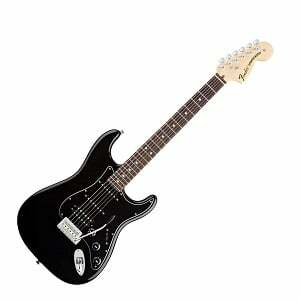 More info about the Fender American Special Stratocaster, click here. More electric guitars under 1000$, click here.